The dude likes his punk rock when making Mexican. 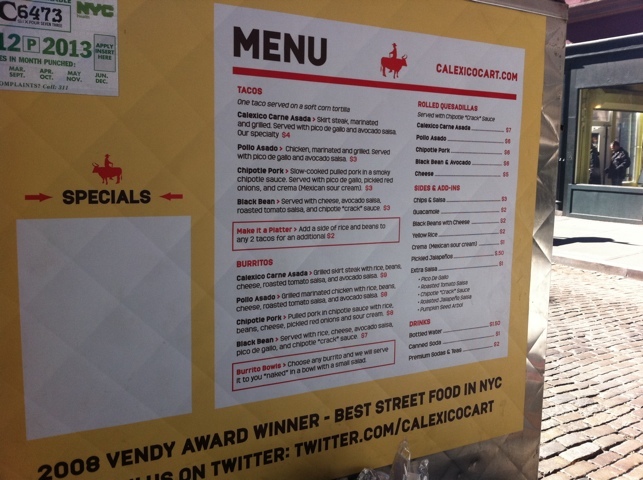 I’ve made my way through many – if not most – of the fancier food trucks in New York City, so I was pleased to finally get a chance to sample Calexico, which I understand to be one of the better carts around – I seem to recall hearing it won a Vendy award. As the name would suggest, they offer a California take on Mexican fare (at least, that was my guess). Young, hip crowd at the cart... I felt like I was crashing a college party. 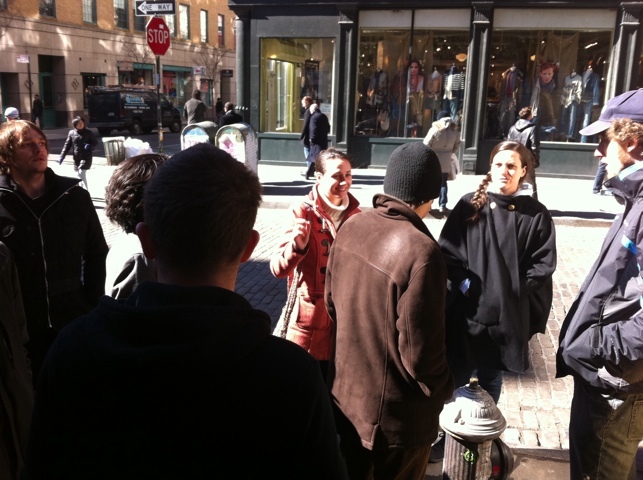 Now maybe it was because the cart was located deep in the heart of Greenwich Village, but the first thing I noticed was the crowd gathered at the cart. For lack of a better term, it was a crowd of hipsters and swells. I also noticed the youngish, hip guys operating the cart were listening to punk music on their iPod speaker system. For a plain old cart, it was surprisingly hip. I got the feeling that if they could serve PBRs, they would. Either way, I asked the gentleman for a suggestion as it was my first time there. 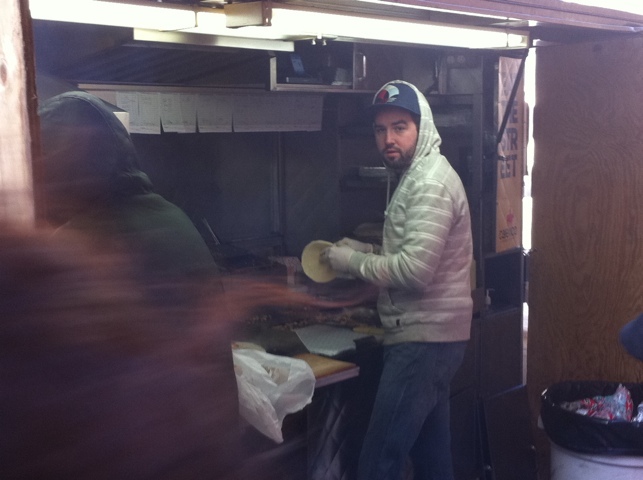 He suggested the skirt steak burrito, which is an easy sell for a guy like me. It was, however, $9. For a burrito? The burrito. Not the widest and fattest, but hefty, nonetheless. When I got back to my desk, I was able to tuck in. The man said it was supposed to be skirt steak. If so, it was very well trimmed skirt steak – better than the cut from Frites N Meats, which I enjoy. These pieces lacked the wire of fat so often associated with that cut. Biting into the burrito you quickly discover terrific, chunky pieces of beefy steak. Black beans around beefy steak. The burrito is also served with a roasted tomato salsa, which is the second-most dominant flavor in it (other than the beef). It adds the faintest acid and a smoky touch. It’s not enough to overwhelm the steaky goodness you get when you bite into one of those succulent chunks. 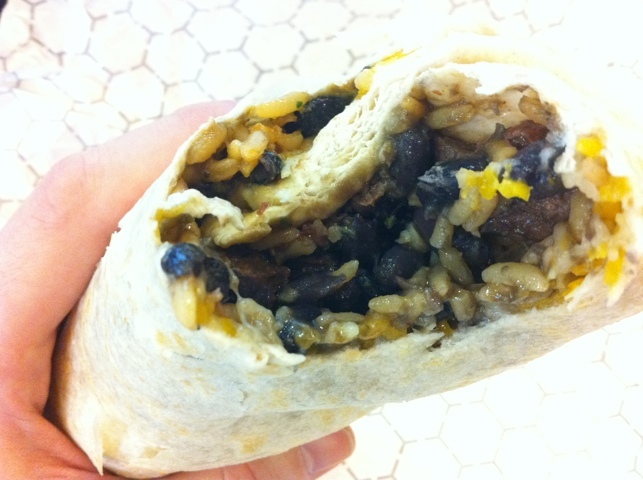 Also wrapped up in the burrito are rice and beans, which didn’t really register as particularly special to me. Perhaps some of the beans added to the overall flavor. There was supposed to be cheese and avocado salsa in there as well, but again, neither punched through in any way to me. 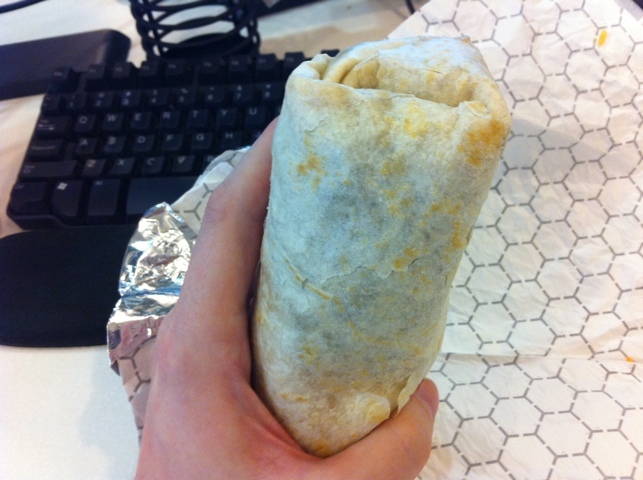 It is worth commenting on the construction of the burrito itself. It completely held together, not allowing juices to drip out or a hole to appear at the back end when bitten at the top. 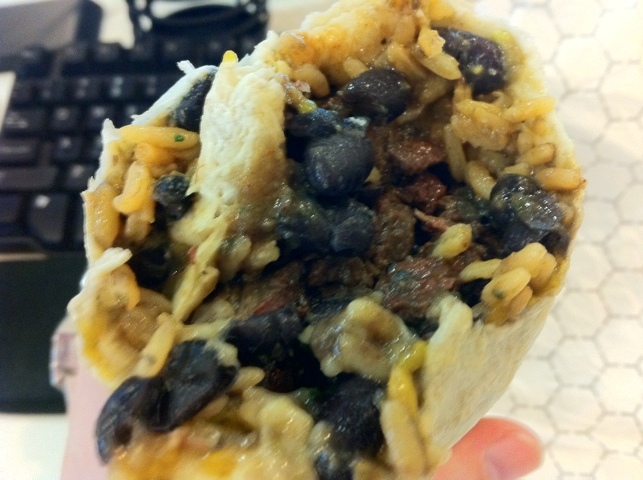 It didn’t fall apart, which is an unfortunately common fate for a burrito. So, $9. Really? That’s what a burrito costs nowadays? Wow. I don’t know… in the West Village, I get it, and the quality is good, but it seems a bit gougy. I don’t know. I’m not sure if it’s up to the standard of El Rey Del Sabor. It is quite good though. I’ll likely be back.